Ron was raised in Corvallis, Oregon, where his musical upbringing was the public school system. In 1992 he began serious music studies with Mel Brown. At the time, Mel was with the Temptations and later Diana Ross. Ron began teaching at various music stores in the local communities and to this day has always maintained a students teaching schedule. Prior to becoming a full-time, professional musician, Ron was in first-line management at Hewlett-Packard for fifteen years. This commitment significantly limited his ability to travel on the music scene. During that time he performed with jazz, country western blues, rock, polka, bluegrass and folk ensembles around the Willamette Valley, at a wide range of venues: clubs, casuals, theater, symphony concerts, and college and public dance classes. In 1994 Ron decided to follow his dream of being a full time musician and moved to Portland. His first job was house drummer and Music Director for the Queen of the West sternwheeler on the Columbia River for over two years. After saving enough to have a home built, Ron began working on land in pit orchestras for various theaters around the Portland area. Concurrently, he was building a steady playing schedule with numerous jazz and blues bands. Ron began working at the Drum Shop of Portland in 1998 where he became the Education Director. One of his steadiest gigs at the time was in a trio with Blues artists Paul DeLay and Janice Scroggins. 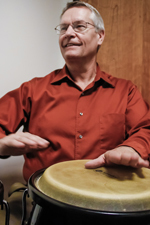 Ron began attending intense percussion studies in Havana, Cuba for several weeks at a time. Ron currently studies the sounds of Baby Dodds, Sonny Greer and other early jazz percussion masters. Ron’s most memorable performance was with the legendary Charles Rousse. Rousse played a lifetime with Thelonious Monk. Ron is currently performing with the Black Swan Classic Jazz Band. If you have a question for Ron, or wish to contact him, please fill out the form below. The message will be passed along to the Education Center and they will get back to you.